In 1936, the University of Oregon constructed Howe Field adjacent to MacArthur Court and Hayward Field. For nearly 80 years, this local gem sparkled alongside Oregon’s growing jewelry box of shimmering athletic monuments. Oregon’s Glasco earned her seventh win and added a two-run home run in the Ducks victory over Cal. Saturday afternoon, in the second to last game at the historic ballpark, the No. 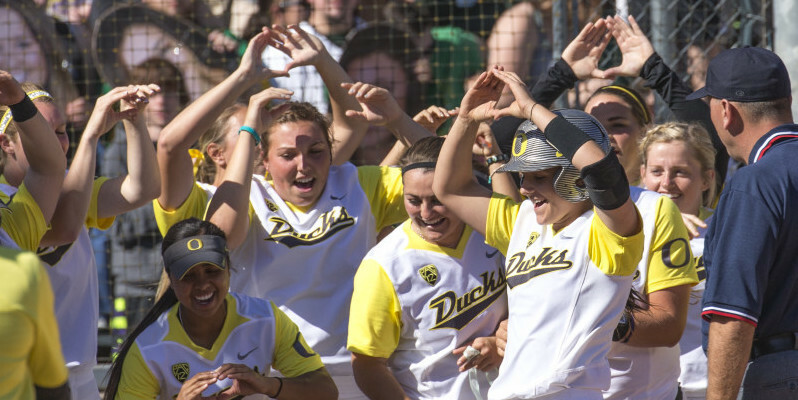 2 Oregon Ducks softball team polished the diamond with a convincing 9-0 run-rule win over visiting No. 18 California Golden Bears in front of a roaring sold-out crowd. The red-hot Ducks rise to 43-5 overall (18-2 Pac-12), smothering top-rated opponents with a firestorm of offensive weaponry and crack pitching. 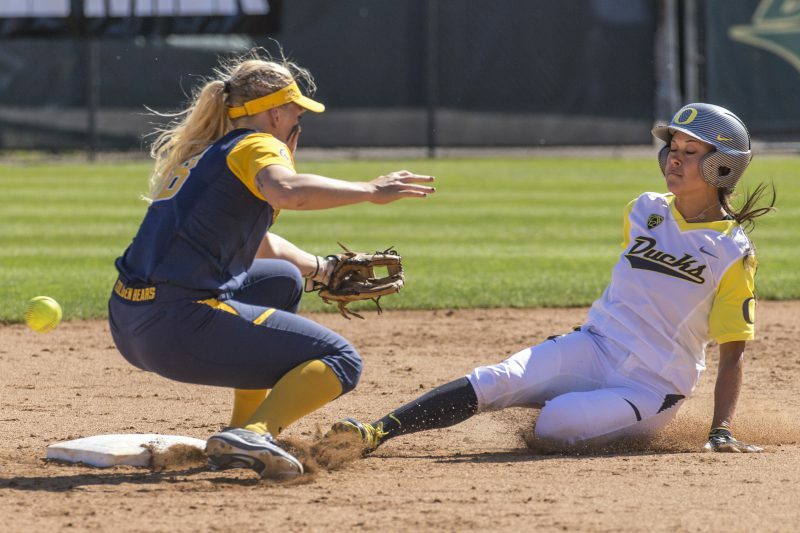 In Oregon’s second straight win of its three-game series against Cal, four different Ducks had home runs, including freshman Lauren Lindvall, who homered twice in Oregon’s offensive masterpiece this afternoon. 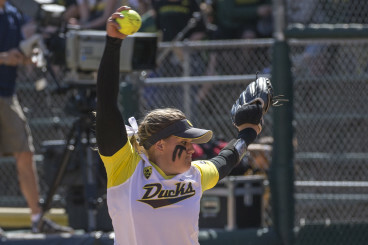 The Oregon bullpen was equally potent as Karissa Hovinga and Geri Ann Glasco blanked the Golden Bears, closing the afternoon with a combined four-hit shutout. Oregon junior infielder Hailey Decker popped the cork in the first inning scoring a two-run blast to right-center field to give the Ducks an early 2-0 lead. The second inning didn’t get any easier for Cal’s sophomore pitcher Katie Sutherland-Fitch. The very first pitch, Lindvall air-mailed a solo shot over the centerfield wall. Sophomore Nikki Udria, staying in fashion, had a two-run home run, catapulting the Ducks to a 5-0 lead to end the second inning. After two innings of silent swings from the Golden Bears’ offense, Lindvall hit her second home-run of the day (fifth home-run of season) on the first pitch of the third inning, stretching the Oregon lead to 6-0. Glasco’s two-run homer marked the fifth home run of the game in the bottom of the fourth. And it was only proper that Lindvall place the final nail in the California coffin with an RBI single and her third hit to finish the game, 9-0 by run-rule. Senior Janie Takeda stole her 98th base, adding to her new school record for career stolen bases. Glasco earned her seventh win of the season and the Ducks cruised to their 13th straight victory. The final game at Howe Field is Sunday at noon as the Ducks look for the series sweep and a memorable farewell to their historic stadium.